Well, this December and the year of 2013 is drawing to a close! What a strange month this has been. 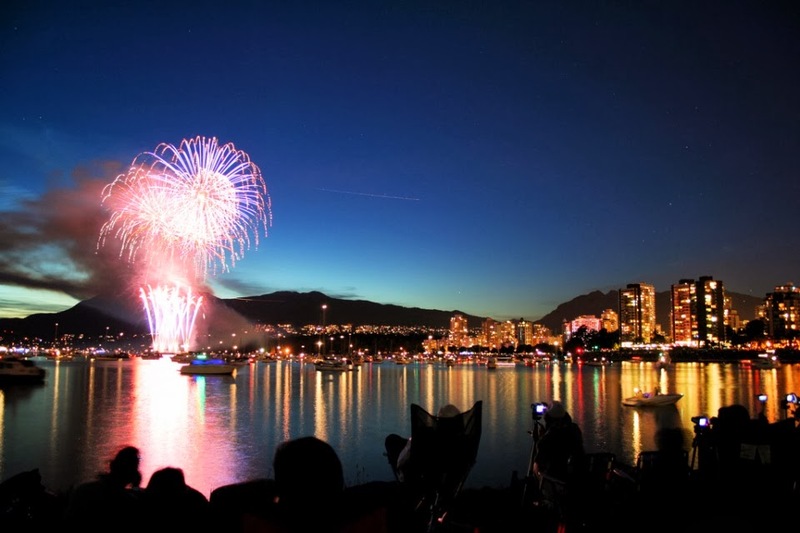 After much scurrying around at home to get ready, I went to Vancouver on the 13th to look after my Dad post hip replacement surgery and found that he was delayed from being released from hospital. So my 'job' became driving to the hospital daily and assisting him there until I drove home nightly. 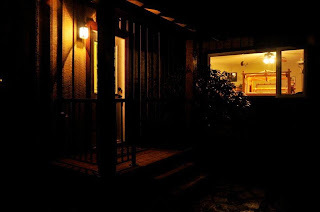 Home was a hotel/ motel room, which was comfy but not home if you know what I mean. Finally he was released to go home and the job of physically getting him to his place fell to me and my mini van..... and it all went very well actually. He's very fortunate to not have any stairs to navigate. I have some experience with all this as I had a left hip replacement in November 2001. Once home, Dad settled into a routine and so did I. I would arrive in the morning and would prepare meals, clean and keep him company. Dad and I had some great chats together. I stayed in touch with Bruce by twice daily phone calls as I was simply too tired to write emails! Then I lost the cell phone and that created a bit of a panic until we got it's service cut off and black listed. Due to Dad's release being delayed, I had to add a couple extra days onto my stay as where he needed the help was at his home. My sister came and did some additional cleaning and vacuuming which was very helpful. Dad seemed to be doing just fine and progressing, but at age 83 healing is a much slower process. Finally on the 22nd I was driving to the ferry for home and despite the heavy traffic I got on the 3:10 pm ferry and walked in the door at home at 7:30 pm. It felt *so darn good* to be home! Bruce had lit up the studio so I could see my looms in there and I even took a minute to just sit with them. I was very tired but the next day we had to get our Christmas groceries, then relax for the next few days. We had a prime rib roast beef on Christmas Day and made lots of phone calls to friends and family. Our next treat was to go and see the movie: The Hobbit: The Desolation of Smaug in 3D on the 27th with a dear friend. Now that was great and we have agreed to meet up for the third and final part next Christmas. We came home later that night to learn my Dad had been taken back to the hospital and now we are waiting to learn what is happening. 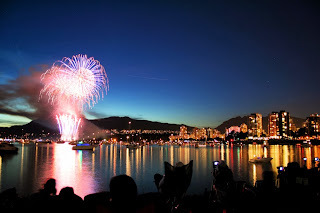 New Year's is just around the corner and we will be spending it with friends over a turkey dinner and hoping for a better 2014..
January is the anniversary of my starting this blog way back in 2008 and I think its time for a small celebration! Anyone who leaves a comment on this post , and possibly another post between now and January the 8th, will be entered into a draw to receive one of my guest towels. So be sure to leave a clear way for me to contact you. Here's a taste of what you may receive.... it will be one towel and you will have a choice of colours. Its been eighteen months since I opened my Etsy shop "Thrums Textiles" and you must put in time to learn the ropes in order for it to be a success. Its like anything on the internet and has its little quirks and the learning curve. Listing items doesn't look too difficult but as you click on one small box.... more suddenly appear that need your attention. Then there are the support groups and teams to join and participate in and how to get yourself seen among over half a million shops. The secret is to make connections using the groups and to be very, very patient for the first year. I had decided to participate in an art gallery sale by the Shuswap Guild in Salmon Arm, BC and I was astounded that even with an almost empty Etsy store, I still managed to sell five items. Seems the Christmas rush is upon us! Then while you are doing your 'research' you find some nifty things to tempt you into buying and you know where this is going... It seems that Etsy store owners end up buying from other Etsy store owners! Nothing wrong with it and a sale is a sale! I also found Heike's shop "All the Pretty Fibers" and her lovely hand dyed yarns. I have bought some yarns from her over the past year or so and we have come to know more about each other. Heike lives in Rothenburg, Germany and produces beautiful hand painted fleece for spinning as well as hand spun yarns. She has a keen eye for putting colours together and she is able to get rich deep colours out of the dye process. I decided to use it as warp to keep the beautiful colours together in the warp and chose a simple turned twill or Drall weave. My weft? 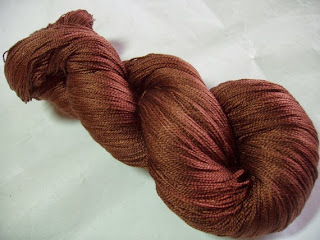 Hazelnut dyed 100 % mulberry silk, also from Heike's shop. You might recall this project.... it actually starts out with much the same photos! Heike saw what I had done with her yarns and bought the scarf.... so the yarns made the long trek all the way back to Germany! Heike has included the scarf as part of an exhibition of what has been made from her yarns and fleece! I'd like to invite you to go and visit the amazing things people have made with the yarns and fleece she dyes in her home high in the German forest and send out to the world. The skill and imagination of some of the contributors is wonderful. The website is called "Needleworks- Pleasure" and please click here to visit. Sorry I haven't been as front and center with posts as per my normal posting schedule. I'm dealing with setting up and transferring data and files from my elderly Dell laptop over to my new HP laptop that has Windows 8.1 and its been quite a learning curve. I'm been using Chrome and Vista on the old one.... and the new computer's systems will take take some getting used to. I'm working on it daily.... but it will take time to get all my extensive picture files shifted. So for now, making a blog post needs two computers to get the job done! I have also been dealing with an infected tooth after a substantial filling was done. I have antibiotics 'on board' and working now and I'll be getting a root canal in early January to start my 2014 off. Its hard to be productive when your jaw is banging away at you! 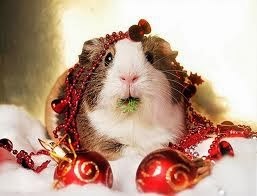 This is also a very busy time for everyone right now with Christmas almost upon us. In the middle of all this, I must leave hubby and the dog at home and go help a family member for a week. Recovering from an operation is tough at any time of year but Christmas brings its special challenges. Ferry rides, hotels and travel arrangements when the whole world is on the move! I'll have quality time with my Dear Dad for week. So I hope to get another post up just before Christmas and in the mean time, I wish you all well with your weaving for gifts, and planning for time with friends and family! I like to play at planning future projects on paper and then winding up the warps ahead of time. Its satisfying to have another warp ready waiting and you can beam it right away. 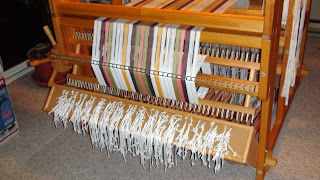 Then, I'll divide my time between threading and sleying on the loom and doing any finishing work on the newly removed cloth. I must multi task to avoid stressing my joints and its probably a good idea for any weaver with a healthy body! I had an all black warp pre-wound and it was intended for a project on the big Woolhouse loom, but with the loom being advertised for sale, I want it cleared off and a smaller cotton sample warp to be placed on there. Right now, the loom patiently waits for me to sit and finally complete the ongoing project. So the black 8/2 tencel warp is now homeless ! I double checked how many ends there were and decided to add about twenty four more to the warp and I loaded it onto the Louet Spring instead. I have the twelve shaft tie up in place and now know the basic pattern off by heart after weaving the recent two shawls. It would be a nice twist on the current theme and also not waste the black warp! It beamed up quickly. Bruce holds and tensions the warp while I wind and it goes very smoothly! I love the system Louet has devised for their looms as it give consistently beamed warps every time. Oh, and the practice of beaming consecutive warps also helps! I also used the two sticks at the start again, and it worked beautifully. I think this will be a permanent change for me! This time its not about colour blending to create iridescence but something more simple and elegant. I had visions of a black wool winter coat and someone wanting to have a scarf to really set it off nicely. Of course the customer may have a completely different idea of what it will do for them! Many of my tea towels have been turned into table centers, and one wider scarf even became a skinny table runner! A towel of mine on a table top in Michigan! I wanted one to be a nice rich red. So I searched the stash. Lots of burgundy, pink reds, and so on but not what I had in mind. Finally I found a small part cone of 10/2 tencel in a colour called Persian Red. A deep colour but a touch of coppery orange or that Turkey red you see in kilims. That was what I had in mind! My stash of 10/2 dyed tencel is getting smaller and smaller as they no longer dye 10/2 tencel in large quantities any more. The American weavers market is huge and they collectively decided they prefer the slightly larger grist of 8/2 and so 10/2 dyed tencel faded quickly away.... You can get it undyed now and dye it up yourself, but there is something nice about reaching for a full cone of colour, especially at a time like this. Reds are hard to photograph.... but this one is very close! Being a finer weft yarn, it took longer to weave and compacted the pattern a bit. A different slant on the previous projects, but nice all the same. I also started and ended the scarves with a run of black silk to give them a more finished look. I'm still seeing that nice black wool dress coat or dress suit! This time they looked like they needed a bit of something extra .... so I decided on small bead and Swarovski crystal accents in the corners only. The "less is more" concept. It never fails to amaze me how the tencel looks flat, even lifeless after washing, even a little lumpy in texture.... but once you give it that hard steam pressing, it comes alive! Then I had to wait for some sunshine to photograph them as they are dark enough as it is! I loaded them into my Etsy store as from recent activities there, people are Christmas shopping! The silver and black scarf sold in less than 24 hours.... and is going to Switzerland! Given the winters there, perhaps it will be paired with a black coat! The loom is reloaded and the final project using this draft and tie up is about to start. These last three magenta scarves will take time ( and one is presold!). I will be more than ready for a change on the loom once they are done! I will be sending away a number of my handwovens to a sale held by the Shuswap Spinners and Weavers Guild in Salmon Arm, BC at their beautiful and historic Art Gallery and the shawl went from here, to being folded and packed away. This was my only chance to get some pictures of the shawl as it might not come home again after the sale. The low lying morning sunshine lit the whole studio in a golden glow. 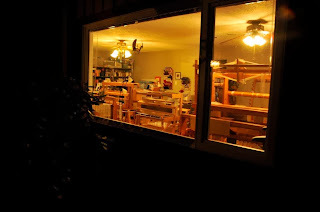 It just invites you into the space and encourages you to take a seat at a loom and start weaving. The second shawl is the same magenta as the first but this time I used navy blue 8/2 tencel weft. There is some iridescence but its not as prominent as the dark teal and magenta shawl. This shawl is more subtle. It makes a statement but it leans more to quiet elegance. Once again, I tried the sticks at the beginning and again, it worked beautifully. The scrap gold cotton above the sticks just lined up neatly and it even seems to minimize draw in. Once under way, I did use a temple as I don't like the floating selvedge being rubbed and fraying through. This was more of a preventative and it seemed to work! Twisting the fringes took some time and again, no beads. I do have some fine fine navy blue seed beads but it just felt better that the two shawls stand on equal terms together. Does that make sense? You can see the iridescence in these two pictures above. I'm going to weave another shawl like this one again, but for me... and in time for our 30th wedding anniversary in 2015 (if not sooner!) There better be a party for me to go to wearing it, or at least dinner at the Empress Hotel ! Another warp has gone onto the Louet Spring... 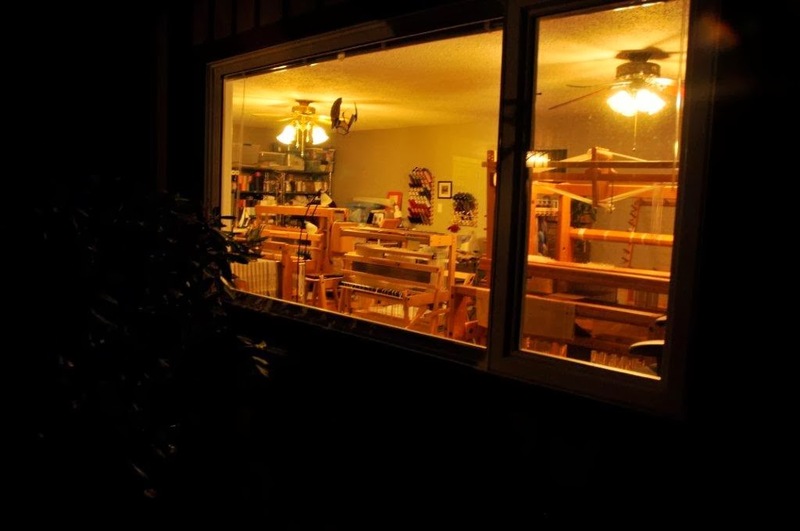 I have an inquiry on the Woolhouse loom for sale which *may* blossom to something nice for both me and the potential buyer. Nothing concrete as yet. So, please continue to spread the word! Some parcels arrived with more goodies. These warps were meant for the Woolhouse loom but they will keep in the queue for the Louet Spring. These are painted warps by Kathrin Weber's Blazing Shuttles and her FB Warp of the Month Club. They are 8/2 hand painted cotton and you are looking at October's "Winter Blue Berries" on the left and September"s "greens, golds, magenta and rust" on the right. Quite different and I love both for many reasons. Click on the links to learn more about the sizes available and more about this growing on line business! These will evolve into kitchen towels and one will most likely be loaded just before my first surgery in the spring. The simple act of a simple treadling pattern will be therapy much like last time when I got a hip replacement (which was 12 years ago on November 7th! Has it been that long already?) I want to insert 8/2 black cotton 'dividers' to delineate the towels, work with a structure and make the colours pop. The threading and treadling must be a straight run for ease... and pattern in the tie up. I'm thinking my old friend "breaks and recesses". The weft colors would be any colour you see in the warp. Just an idea and I'll look around for another possible draft. 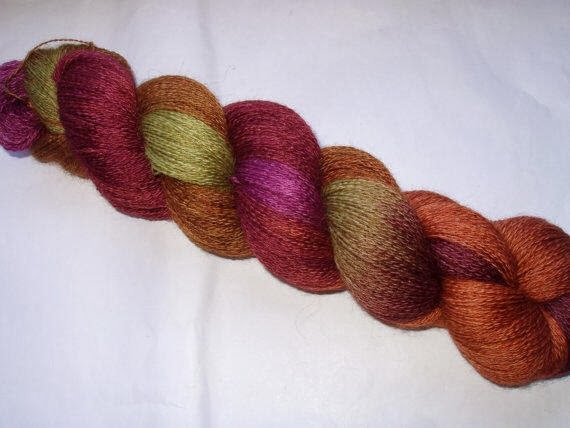 If you can think of something you feel fits the criteria (easy straight run treadling, 8 shaft preferably and something that shows off the colours! ), please let me know in the comment section. Thanks! I'm leaving the warp bundles hanging up as I love the punch of colour in the studio. I'm going to load up the Jane table loom as well with something simple in case my lower half isn't cooperating with post op rehab and my urges to weave again and Now! I'm going to set up the tablet cards and maybe even the inkle loom so I have all the bases covered. A couple of months ago I was playing around with using an existing tie up on my Louet Spring and matching it with new drafts. Not all were compatible of course but a few twills turned out very nice in the design phase, and one in particular. It was a complex twill with a long repeat and I used red purple tencel, or magenta for the warp. In that post the two scarves, one woven with dark teal and the second with navy blue, were simply beautiful and I was thrilled with how they turned out. Apparently other people thought the same because when I listed them in my Etsy store, they were snapped up within days! I wanted to weave more while the tie up was in place but my recent commission order for two runners cut that idea short. But I had a dream to do it again, and soon .... and this time expand the dimensions to a shawl. The scarves were lovely, but a shawl would be ..... well, take a look! I warped up enough length for two shawls, wove and cut the first one off, and the second one has just come off the loom and being finished as I write with its debut to come next time. I'd like to back up a bit and take the project back to the beginning...and it started with a yarn order to Webs for more red purple tencel. When it arrived I noticed a slight change in the shade when compared to a skinny cone left over from last time. It was more 'grapey'. I wasn't sure how the combination of colours would look this time but decided to go ahead with the project anyway. So, here's the start: knotted warp laced on, then three shots of 8/2 cotton and then beat, repeat again... and this closes the groups up. I wove a couple dozen shots of 1 to 12, then I made a shed and inserted a warping stick, then another. Then I wove a couple of runs in a light coloured cotton. Beating against the sticks was an interesting feel! It was firm and provided a nice foundation. It gave rigidity to the whole width of the warp. The light cotton section showed that there were no threading errors, which was super! I could then advance the warp for the fringe allowance. Now please note that the area where I did the test weaving and placed the sticks would also be part of the fringe allowance. None of that is wasted! At this end of the warp, only the knots were cut off later and thrown away. As you can see its working well and weaving up beautifully. I used a temple to reduce any draw in and as you can see it is sitting nicely. Or was it the sticks that set things up with a firm foundation? I plan to use them again! So the weaving continued on for eighty five inches or so and I cut off so I could get a jump start on finishing. I have a sale I'm trying to prepare for and since I must mail things away, timing is important! Next up was washing. I soaked it a long time in hot sudsy water and squeezed it out well. I spun it out in the machine and hung over a rail to dry. The next morning I gave it a hard press with the steam iron. I think the shawl carries the 'razzle dazzle' off just fine. The tencel's beautiful drape and sheen never fails. I can hardly wait to see the next one! I'm happy to be weaving still even if it is slower. I've heard now that the soonest I can be expected to be called for surgery is April 2014. There is some good news and some bad news. The bad? I can now expect to have another full hip replacement *first* on my right side, then, a full left knee replacement and eventually my right mid foot bone fusion. Its all a bit much to process right now, especially since my husband is to have surgery in January. I keep being invited to a Pity Party, but so far I have declined! Let me share my weaving friend with you. This is a Woolhouse Tools Gertrude Loom, number 61, who I call Emmatrude. We met for the first time July 11th, 1998 and we have spent many, many happy hours together. As I explained in my previous post I have decided to sell this loom as she's not getting the attention she deserves anymore.... and its not her fault. Weaving on her (or treadling to be more precise) seems to aggravate my lumbar spine where I have some disc issues. Okay, enough of my whining and let me give you an introduction to her. She is a 45 inch weaving width, 12 shaft parallel countermarche (or floating lamms) with a full set of 16 rear mounted treadles. These are great for those drafts that gobble up treadles such as summer and winter. Treadling is made much easier due to all texsolv cording running over pulleys smoothly. The rear mounted treadles maximizes the effort used. There is a second warp beam if you like to weave supplementary warps or even pre-load a second warp while weaving off the first one. Great for production weavers. There is a set of sectional rakes, modified from a Leclerc sectional. It can be used on either beam, though I prefer the lower setting myself. There is a Woohouse Tools tension box as well. There is a full length raddle and two sets of lease sticks, one ten dent reed, and she has 3600 heddles for any project you can dream up. (that's 300 per shaft and it only came with 100 per shaft) Apparently I was dreaming big when I ordered the heddles. There is a cloth protector to keep your newly woven cloth from being rubbed the wrong way by a tummy. Then, she also has the 20+ tie up system that gets the weaver out from under the loom for tie ups and sitting at the back and pulling cords in minutes, versus the previous hours. Save those knees! It may be tedious to set all the cords up at first but you'll agree it was so worth it when you can sit and pull cords for an eight shaft / eight treadle weave in eight minutes. Speaking of cords they were all replaced brand new as of July 2012, when at that same time, the Big Girl got a thorough cleaning and oiling. Another side benefit of the 20+ system is to pull the cords up tight so all treadles are lifted and you can easily vacuum underneath. You see this loom is a Big Girl and not easily moved coming in at approx 450 pounds according to John Low the builder based on his freight weights. She's tall : 69 inches high over all to the top of the jacks. She's beamy: 60.5 inches wide overall, with 45 inch weaveable. I have the original manual and instruction papers for the loom and all upgrades added to her over the years. There is a nice bonus to this loom (if she isn't special enough already) and that's she can have a Drawloom attachment added to her. This can be also detached or suspended so you can do regular weaving or re-set to a drawloom once more. This added device would add to the overall height and length for footprint considerations. At the time of this post, Mr Low is still manufacturing all the parts for the Gertrude looms, including the drawloom portion. As you can see, this is no ordinary loom and no freight box for her! 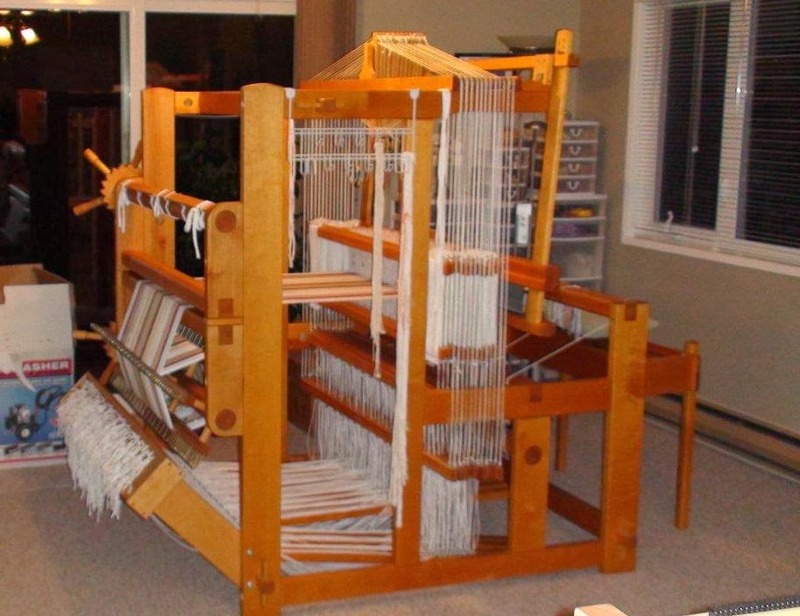 I would like the loom to viewed in place and the prospective buyer to visit and try her out. Once my current warp is complete, I will place a sampling warp on for the viewers to try. The purchaser will appreciate that its helpful to be present during the dismantling for their benefit and help to ensure a happy reassembly at their home. So I must decline all offers that include my handling of the shipping as I'm not able to undertake this at this time. Pick up at Duncan on Vancouver Island only please. Totals: 8106.00 plus freight costs of 8% of total purchase of 648.48 for grand total of $8754.48 in Canadian dollars. 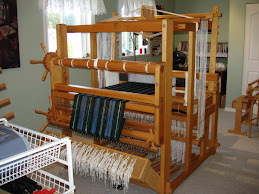 This is added as this is an additional cost of the loom when ordering directly as brand new. While my loom is used, I think we can agree that she is in 'like-new' condition and *very* well maintained. ....can you see yourself here?